Collective is built with one thing in mind: product-focused. Showcase your products sold at Etsy or build an affiliate site with ease. 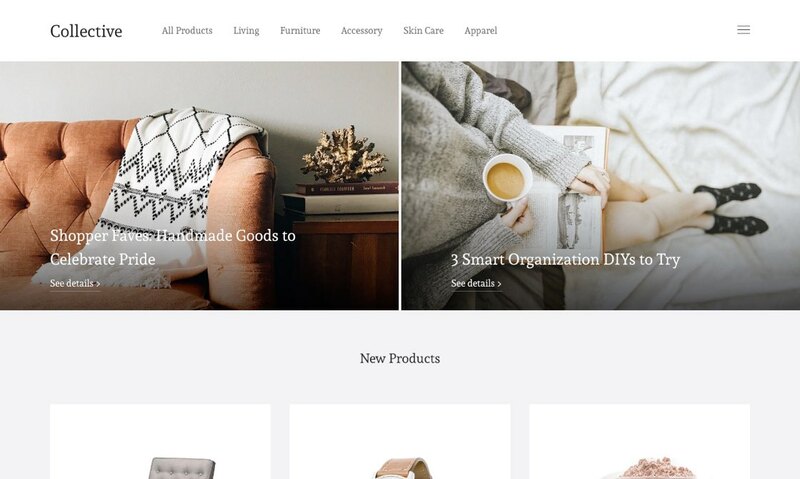 Whether you’re building an affiliate site to earn money from various Ecommerce such as Amazon, Walmart, Ebay, or just want to showcase your products sold on Etsy, Collective is a perfect fit. It features an Ecommerce-like grid-based layout with its minimal, clean and timeless design, so your website won’t look outdated any time soon. Collective comes with a built-in intuitive search form, helps your visitors to easily explore every product. Nothing would be missed — even for huge inventory. Note: To serve its purpose as product-showcasing and affiliate-based theme, Collective is able to handle only single picture for each product that we believe is enough to describe the product well in addition to develop curiosity. Collective is entirely responsive, means your content will scale to fit any screen size, from desktops to mobile phones. Collective has Buy Button built-in, allowing you to showcase your products sold on Etsy, Amazon, or direct transaction with PayPal. Collective is based on the v3 framework with show/hide widget capability and new comment form UI. Backgrounds and scripts used to create Collective are included in a separate folder. Making backup easier.